Beneath the Stains of Time: What's Up in the Attic? "Enjoy the fantasy, the fun, the stories... but make sure there is a clear sharp line drawn on the floor, so you can step back behind that mark and re-embrace reality... to do otherwise is to embrace madness." - James Randi, the magician who explains miracles. 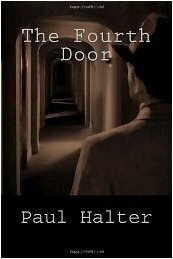 When I first learned of the detective stories penned by Paul Halter, it was the name of John Dickson Carr that captured the attention of this locked room enthusiast. Halter naturally found, what can be described as, divine inspiration in the myriad of books left to us mere mortals by the Greatest Player who ever participated in the Grandest Game in the World – and his most ardent followers were ready to tear his mantle from Edward Hoch's back and drape it across Halter's shoulder. That piqued my interest, to say the least, and the collection of short stories, The Night of the Wolf (2006), entailed a lot of promise and contains one or two gems, like "The Abominable Snowman" and "The Flower Girl," that will most likely became staples of future locked room anthologies. This probably explains why I ended up disillusioned with Paul Halter, after reading The Lord of Misrule (1994) earlier this year. I expected to witness first hand the second advent of the greatest mystery writer who had ever lived, but instead was treated to a fairly standard and flawed detective story. In spite of its fantastical premise, it lacked the atmospheric touches and clueing you'd expect from John Dickson Carr's heir. But worst of all, there was no sense of time and place, which is not an unimportant element if you decide to set a story at the turn of the previous century, and the ghost-like presence of the masked figure, cloaked in black, who's accompanied by the tinkling of sleigh-bells never became the terrifying hobgoblin like any of the nightmares dreamed up by Carr and Talbot. So evidently, I concluded that this Gallic scribe has a heart that beats in the right place and valorously tries to continue a tradition that's truly worthy of being preserved, but that he was only a second-stringer at best – at least as far as novel length narratives are concerned. 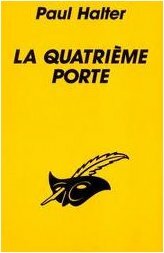 Well, last night I blazed through his second roman fleuve, The Fourth Door (1987), and I was wrong. Stylistically, it has the same flaws as The Lord of Misrule, but plot-wise, it has nearly everything you hope to find in a locked room story – and the patterns that emerge from the plot will both fascinate and please the most demanding mystery readers. The Fourth Door is set in a small, undesignated hamlet during the early 1950s where three befriended households, the Whites, the Stevenses and the Darnleys, are torn asunder by supernatural events and several, seemingly impossible, murders with most of the otherworldly activity coming from the attic room in the home of Mr. Darnley – where his wife killed herself years previously. At least, it was presumed to be a suicide since the door and windows were locked and fastened on the inside. Lodgers reported footsteps emanating from the room and neighbors witnessed a glowing light passing the attic windows. Needless to say, none of these lodgers roomed very long with Mr. Darnley. That is, until Patrick and Alice Latimer arrive in town, one of them apparently endowed with the mediumistic gift to communicate with the spirit realm, who promptly take up their residence at the reputedly haunted house – and from there on out the fabric of reality begins to slowly disintegrate. The events that followed include a séance, during which Alice Latimer is able to answer a question written down and sealed away in an envelope, and someone who's seen at two different location, at exactly the same moment, before disappearing for the stretch of three years are only a prelude to an even more baffling occurance – a murder in a sealed attic room! As an experiment, in the hopes of establishing a better line of communication with the ghost of Mrs. Darnley to find out who murdered her, the spiritualist Patrick Latimer will hold an all-night vigil in the haunted room, which is not only locked but also sealed with wax and stamped with an imprint of a rare and unique coin – picked at the last moment from a collection of 600 of such specimens and never left the hands of the witness after the room was sealed up. But when they break open the door, Patrick Latimer has evanesced and in his place, sprawled on the floor, lies body of another man with the handle of a knife protruding from his back! The construction of the sealed room illusion is quite simply brilliant and I feel very smug for having stumbled on the main gist of the trick before it was even put up for performance. When the corridor and lay-out of the attic was described, I immediately knew how the trick would be pulled off and only missed out on the finer, more subtle details. The part I got wrong was actually embarrassing clumsy compared to what actually happened. I also have to commend Halter here for motivating this elaborate set-up and why anyone should go to all that trouble to create a supernatural crime. There's also a second murder, committed in a house whose immediate surrounding is carpeted in an expanse of un-trodden snow, which has a delightfully simple, as well as shocking, solution – and even better motivated than the first one. As noted in the story, it's quite possibly unique in the genre. No mean feat! Plot-wise, this is as good as they come and the cleverly constructed, multi-layered solutions are the impetus that drives our undying love for these stories. Nevertheless, I have to state here, empathically, that in spite of these triumphs I still wouldn't rank Paul Halter alongside John Dickson Carr. The fact that he writes detective stories in which people are bumped off in sealed environments at the hands of apparent supernatural agencies are not the main reason why we read the tales from the grandmaster of this particular sub-genre, but for the gripping narrative that gradually tightens its iron-glad grip around your throat and impresses you with the dread that every shadowy nook harbors unimaginable horrors. I never had even as much as an inkling of this feeling with this book nor was there any genuine sense of time and place. There were several references to the mounting terror in the village, but merely stating that the atmosphere was threatening does very little to convey that feeling to the reader. The only time he came close was the part with "the cold hands," but that arose from the plot that had become so complex and turned upside down at that point in the story that you couldn't help but feel bewildered. Another problem was the village setting. Which village? Throughout the story you get the idea the entire village consists of only three houses and is only inhabited by the characters that live in them. So I would have to disagree with those who stated that Paul Halter did everything right in The Fourth Door, but I will concede that he more than delivered on the parts that really mattered. It's one of the most intricately constructed detective stories I have read this year, with a plot that twists and coils like a boa-constrictor in an epileptic fit, and I was enthralled with the patterns that emerged from the plot. I said it best in my review of Marco Books' De laatste kans (2011), "It's not entirely unlike watching someone emanating perfect circles of smoke that seem to playfully interact with one another." 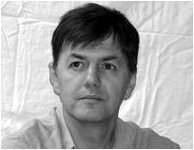 To sum it up, this is nothing short of a tour-de-force of plotting and restored the faith I had lost after the previous novel – and the mystery community owes John Pugmire one for his untiringly efforts to bring his stories to an international audience. You can help him with this by simply picking up a copy of The Fourth Door and enjoying the story, and, if possibly, share your thoughts with the rest of us. I'm no French person, so I'm far from the best to comment on style- I read, I comprehend, and I enjoy. But I really have to disagree with you here, because due to the nature of the plot, any stylistic flaws Paul Halter are actually a plus rather than a minus. Yes, the village is not described in detail, as you only get to know the inhabitants of the three houses, but is that really a problem? I don't think so. The community is closer and so you get to know the characters more and like them more. Halter does the small things very right indeed... and like I said, his sense of humour is very appealing. Halter is often compared to JDC, but rarely is the comparison as apt as it is here. I stand by my guns and say that Halter delivers on all fronts this time around. You have to correct me if I misinterpreted you here, but do you mean that stylistic flaws (i.e. lack of atmosphere, setting and such) are a plus because they would only distract from the plot? But doesn't that sort of demonstrates my point? If Halter is unable to intertwine a few descriptive passages, to bring the village to life or give the reader a taste of the mounting terror, without lessening the impact of the plot than he clearly isn't in the same league as JDC – brilliant though his plots may be. Nonono, I meant that in this particular book, due to the nature of the plot, the stylistic flaws are actually a plus. I don't want to go into more detail because that would spoiler territory. Halter's plotting and imagination are often brilliant; JDC is still the ultimate master for me, but I love sitting down to a Halter as well. I love how he mercilessly mocks the "pure psychological speculation" approach to detection through his police investigator, for instance. His wicked sense of humour, tight plotting, and fascinating imagination make for a killer combination. I like his attitude towards the genre, which his fellow countryman and excellent stylist Fred Vargas shares by the way, and despite a weakness for characterization, it's a weakness JDC shared. Sometimes, he does a fine job with atmosphere, like with LE DIABLE DE DARTMOOR. At other times, despite a marvelous premise he misses some glorious opportunities for the sinister (LE ROI DU DESORDRE). But he wasn't trying to be creepy or sinister here, with ghosts and ghouls at every corner... I found he succeeded marvelously in a small sense of unease, that (to quote Bill Shakespeare) "something is rotten in the state of Denmark". I have no idea how much sense I made just there. From one mentally unstable fanatic to another, I perfectly understood what you were trying to say there and I concede that most of the positive attributes you mentioned smooth out the negatives – but a flaw is still a flaw. There was a botched attempt here at establishing an atmosphere by referencing, more than once, the mounting terror in the village and that vague sense of unease, for me at least, came only towards the end, but sprang from the plot and not the writing. I just think that if you write a story, set in the past, about haunted houses, séances, reincarnation and supernatural tinged murders you should convey some of that frightening atmosphere and time of place over to the reader. In this case, the plot was more than enough to carry the story and overlook those short coming, but with a lesser plot, like The Lord of Misrule, they become painfully obvious – and drag down a story even further. But to be honest, I think I'm also handicapped by the fact that I can't disconnect Halter from Carr. When I first read his name, it was coupled with that of JDC and announced that his successor was at long last discovered – and that was a mistake, IMHO. Heck, I even remembered a comment that said Halter is what Chesterton would've been if had written full-length Father Brown novels. Great comments to rouse readers interest, but not very clever advertisement in the long run if your man can't fully deliver on them. I really wish I had never read all those comments and just read him cold. Plot-wise, though, I think Halter is more than capable of matching JDC when he's at the top of his game. If there's any one good reason to read Paul Halter, it is his ability to write some of the best fair-play impossible crimes ever. That being said, having the wrong expectations could be killer. I had the good fortune, though, of getting an e-mail from a silent GAD member warning me of all the flaws of Halter's writing while praising what was worth praising. I can forward it to you later. Sounds wonderful TomCat, thanks for the excellent review. Never read anything by Halter in any language / translation but I am definitely going to go and try and get my hands on it right now. I have to second Sergio. You guys are making it impossible for me to ignore Halter much longer. Thanks for your thoughtful analysis, but I must respectfully disagree on The Lord of Misrule, which I reread yesterday. I found it very atmospheric, and appreciated the leanness of the prose. The clues were there. I agree that comparing him with Carr is a mistake; some of Carr's work-I'm partial to Merrivale-especially Plague Court, Skeleton in the Clock, and Red Widow-will endure for a long time, but given that he's no longer with us, it's wonderful that someone is attempting to use his creative imagination to come up with intricate puzzles that require hard, lateral thinking. More in English, please-and soon! Tomcat, you and Patrick pushed me into reading "The Fourth Door" - and I am very grateful. I enjoyed it thoroughly. I'm not going to get into a comparison between Halter and Carr except to say that I enjoyed the plot of "The Fourth Door" immensely and agree with you both that it would have been Carr-worthy! Glad to hear you enjoyed the book, Les. I don't know if you have read his collection of stories, Night of the Wolf, but I think you will enjoy them as well. It's a slender volume jampacked with some really clever and imaginative stuff. Everybody Loves a Good Mystery!